So this is it, the end, it’s over! I can’t believe the Willow Pattern Room is finally finished and my internship at The Stencil Library is almost complete. The room seems to have fallen nicely into place after the larger items were decorated and it looks absolutely fab-dab, I’m so so pleased with it. We’ve kept you up to date during previous posts about various projects and chapters of the willow pattern story and I’m ever so glad because overall it’s been such a large project that I couldn’t possibly tell you about it all in one post (I think the blog would quite possibly overload and suffer a heart attack)! It feels like completing the attic room has taken forever but if we'd had a lump of time devoted to get it decorated all in one go I don’t think it would’ve taken very long to do at all. Of course we were working on several projects not just the Willow Pattern Room. and various other things that I stencilled. I wrote that they each took about a day to do. Helen and I stencilled items that didn't make it into the final edit such as the peony border floral bedcovers, although they looked great. It’s amazing what fantastic results you can achieve in a small amount of time. I think our willow pattern wall stencils might might look a little daunting to a novice stenciller beacuse they are so large; however they were outstandingly tame when it came to staying on the walls. The only reason they were a little tricky occasionally was because Helen and I were working on uneven, lumpy walls and stencilling over ourselves. We applied a light spray of adhesive and some low tack tape to the stencils to hold them. The stencil designs were adapted from a repeating willow pattern design in our range of Chinese Style Stencils. On a typical flat wall it wouldn’t be an unrealistic goal for one person to complete the stencilling in a day. Now that it’s done and looks so amazing, I think that I'll be sprucing up furniture that I already have rather than buying new. Adding stencilled pattern to the furniture means you have completely unique decoration, it takes so little time and it gives a really satisfying outcome. So, the room is finished and I am really happy with the result and knowing that I had a large part in decorating all the various surfaces. Hi, Emma here. I have written many posts on this blog recently but I’ve never really told you much about me, I’m a student at Huddersfield Uni and I’m studying Surface Design for Fashion & Interiors, I’m currently doing a placement year before returning to Huddersfield in September to do my final year (SCARY). This kind of placement is ideal for experience in the 'interior world'. Also it was a wonderful opportunity to develop a stencil for The Stencil Library! Helen mentioned that she’s been meaning to get round to creating some new stencils of horses, so she gave me a sort of brief of how she wanted them to look and the style she'd envisaged. This was the brief from Helen 'Asian-ish, Art Deco-ish, line drawing-ish and Chinese watercolour...ish' Then she gave me a few pictures for inspiration and I drew them up onto some drafting film using a 'stencil pencil'. I imagined the shapes as a border...and that is how I placed them on the film.Actually, I drew three different borders. Chips, the designer then put them into his computer and turned them all into working stencils. The prototypes were then tested with paint onto paper to see how well they worked. After all three stencils had been tested with much enthusiasm from Helen I wanted to see how well they could work in different rooms at different scales etc. So, I had to call upon my (now slightly rusty) PhotoShop skills. After an hour or so and a few not so pleasant words of a cursing nature I finally managed to refigure out the old tricks and realised that actually my horses stencil did not have to just be a border, they look really good on a super large scale, how easy that’ll be to turn into a stencil I don’t know, sorry Chips! I've just been flicking though all the photo folders I now have clogging up Helen's computer. They contain all of the things I've been getting up too during my time with The Stencil Library and I came across a few "before and after" pictures from a couple of projects, and I just couldn't believe how much some of them have transformed... and all from a little lick of paint and some good old tlc. This was once our office manager Rachel's living room up in the attic, and granted, it took a fair amount of time to change but then again we left no part of it untouched! I think this is quite possibly my favourite room in the whole of Stocksfield Hall, I may be a little biased cause it's the only room in which I've played a major part, but the amount of self satisfaction, knowing that I helped put this wonderful room together makes me immensely proud, and I love it! I may try and move in on the sly, hopefully Helen won't notice. This is a sneak peak for another blog post that I am writing. This is another attic room that I have been working on with Helen. She started the wall decoration and I completed it. I chose the JA52 Wave stencil for the door; something not too bright or flashy to take attention from the wall, it was an absolute demon in certain places however it was totally worth it and looks fab! I didn't really think or know much about stencils before I came here but it really has opened my eyes to just how versatile they are and what completely amazing things you can do with them. The posibilities really are endless! You can radically change the look of the most simple things and make them look like they've been professionally done, in a relatively short space of time and with a much smaller hole in your purse. What more could you want? Stencilling for friends, decorating outside the box. Working here is great; when a birthday comes around the tools are on hand to make a personalised, unique gift. This is exactly what I’ve made for one of my good friends Katie, it’s her 21st this week so it was an opportunity to make something special and all I needed was a plain box which I bought from Paperchase. Whilst experimenting I noticed that when the stencilled circle was completed it was slightly too big for the lid so I masked off a small area on each end of the design making sure it was still symmetrical. I would advise making sure the separate quarters of the circle are completely dry before positioning it again otherwise you might smudge the paint! So, the lid took around 10 minutes to stencil. To put the numbers in the centre I measured the height of them and found the centre point of the circle and placed them accordingly. To give the box that little extra decoration I took the same stencil and used it round the sides of the box. The main concern about this kind of project is not the difficulty it’s just about basic housekeeping, so things like making sure paint is dry before re-applying the stencil and turning the box. So that’s it, really simple, but the result is something completely unique to Katie and something she can keep and use for whatever she likes. The thing I like most about this kind of gift is that it’s something no one else will have, it’s not a box that you’ll see in Clintons or even Paperchase and I’m fairly certain it’s something she’ll like very much (if she doesn't she may no longer be my friend). So, the tiniest bit of sunshine appears and we all go a little mad with excitement. Everyone is out making the most of it and Helen and I decided to do the same last week by decorating the canvas sides of the gazebo outside in the garden. After being washed and ironed, I hemmed the ripped edge of the two large pieces of canvas to prevent them fraying and took them up by about 2 inches to keep them off the grass as it seems to have spent a lot of its time this year so far being wet (boo, I know). A pocket was made along the top of the fabric so that it could be threaded onto curtain poles. The canvas pieces are bright orange and the flooring in the bottom of the gazebo is a sky blue and immediately this made me think of Indian colours, so I decided to use a rather large Paisley pattern. Helen has stencilled a garden parasol with it and it was featured in a post last week. The 4 colours I used to stencil the pattern on the canvas were bright metallic paints so when the summer kickstarts (hopefully within the next century) they’ll reflect really nicely, I picked Pearlescent Turquoise, Pearlescent Magenta and two shades of gold, using the brighter of the two to highlight the edge around the Paisley shape. The turquoise paint was used to stencil the middle of the paisley, the same central design was reproduced as a seperate and slightly larger stencil which I randomly placed in between the paisley patterns. They were used to bring flashes of bright colour. Don't forget to apply a light misting of SprayMount repositioning adhesive to a sturdy piece of cardboard and place it underneath the canvas in the part you’re stencilling; It holds the material steady and doesn’t allow bunching or movement whilst you’re applying the paint. Also, it reduces the time it takes to stencil because you’re not battling with the material and it lessens the risk of errors. The best part comes next... putting it onto the tent frame and being out in the sunshine! The canvas slid onto curtain poles on either side of the gazebo. We then found some white muslin which we threaded onto poles on the inside and made them drape nicely, then we stepped back and admired our handiwork. So that’s it, all done, and when the sun is shining and it’s warm in the stencilled tent you could be absolutely anywhere in the world! Painting a floorcloth for the stencilled attic. Whilst I have a few minutes I just thought I'd write a little about a painted floor cloth that I made for the stencilled Willow Pattern room that I have been working on. I started by cutting a rectangular piece of cotton canvas 4ft by 5ft with an inch or 2 on every side in order to fold later on, a seam allowance if you will. This was then sectioned off into coach line stripes of various widths, the great thing about coach lines is as long as you have masking tape you can make them as thick or thin as you like. I painted the floorcloth in colours that are featured elsewhere in the room. All 3 coach lines were painted with Annie Sloan Chalk Paint (I told you I liked it in many previous posts!). The largest of the 3 coach lines was painted in Aubusson, a dark blue, the smallest of the coach lines uses Emporer's Silk, a rich red and the final coach line was Paris Grey. Once the paint was dry the edges of the cloth were scored with a metal rule and blunt scissors to facilitate the folding, the corners were then cut to create a neat fold. PVA Glue was applied between the folded egdes on the underside of the floorcloth then pressed together to make a hem. I will stress that heavy objects are useful for this part in order to hold own the folded hem once the glue has been applied, just leave them there until the glue is dry. So that's it, dead easy, took a day to do and it looks really smart, again so simple but so effective! Willow Pattern Attic Chapter 3 - There's light at the end of the tunnel! To begin with I had to give the table 2 coats of Annie Sloan Chalk Paint in Old White to cover the previous stencilled pattern and provide a base colour that matched the walls. I re-used the same Dulux pale green/teal colour combination which was used to stencil the willow pattern motifs around the attic room. This was the first layer of colour that I applied through the wave stencil and I used the stippling technique. I find that using the stippling technique on a fiddly stencil is easier than a swirling brush stroke. Swirling can some times push paint underneath the stencil and that’s not what you want! I really wanted to give the table a bit of a visual lift so I went for a metallic sky blue to blend in with the teal carefully using the swirl stencilling technique. Now, I will say that using a surface that is smaller than the stencil can be rather tricky as there are a lot of parts you need to hold down which don’t lie flat as the pattern runs over the edge, that and its weight means you’re also battling with gravity ( it didn’t help that the spray mount was useless on this occasion). Therefore, I conclude that being an octopus would hugely facilitate the ability to make this stencil a one man job so I could hold all said fiddly bits in place whilst stencilling over them, but sadly I’m not and had to ask Helen to hold some of the areas in place for me and use some low tack tape but remember to go over the tape outlines afterwards! the great thing about the metallic paints is they are not too vibrant, I didn’t want to take attention away from the stencilled walls as they are the main feature of the room. The sheen from the highlights in the wave pattern work really nicely as they’re only visible from certain angles in the light. Now I know I say this every time but it looks absolutely fab, normally I find that the stencils that are more complicated bring the most rewarding outcome and I absolutely love it! To complete the look I painted round the edge of the table top using Annie Sloan Chalk Paint in a dark blue called Aubusson and edged it with a very fine gold coach line. I masked off areas using low tack tape to create neat, crisp lines. I repeated this colour combination on the lower shelf of the table by stencilling an Aubusson coloured rectangle outlined again by a thin, gold coach line. Because the stencilled table is intended to be a permanent fixture it was given a coat of acrylic floor varnish in order to prevent any typical surface damage. However, be warned I would recommend to varnish the Aubusson Blue parts separately as the varnish seemed to smudge it despite drying overnight. So that’s it, it was a surprisingly quick job actually but it looks great and fits in perfectly despite introducing a sky blue to the original colour palette. The crisp lines give it a really clean pristine look and I couldn’t be more chuffed with it! the day after the pattern pieces were waiting for me in the work room (thanks Chips). Being new to stencilling I thought that it was going to be hideously complicated, however I was pleasantly surprised, the hardest part of putting this design together is marking the dots and making sure they’re as accurate as possible otherwise the pattern will not work. After a while (that seemed to last a lifetime along with a few words that I will not mention) I had a grid of dots, the great thing about this design is that all 4 stencils have holes in them in exactly the same place, so once the grid is created and marked up it’s all about matching them up with the stencil and away you go. I will mention now that if you’re painting a surface like I was (a fire screen) things such as hinges are an absolute demon to both mark and try to stencil over. Now, stencils 1 and 2 are the same and stencils 3 and 4 are the same, and at first I didn’t understand why I needed 2 of the same thing, but it became clear when I tried laying them out, you’ll see what I mean in a minute I promise! So millions of dots and a lot of concentration later I began to see the pattern coming together and it was really really exciting and the end product looked so much better than I first thought it would! 1. Choose your paint – pick three tones of the colour and paint your background with the mid tone. 2. Dots and marking – low stick tape is really helpful for this as you can use a fine liner or whatever to create your marks without marking the background paint as the tape just peels off! The easiest way to start I found was lining stencil one with a straight edge. 3. Spray mount – crucial! This stopped the stencil moving when it came to applying the paint which was so useful! It shouldn’t need spraying every time which is also great as I would’ve forgotten to do it. 4. Line up stencil 1 with the marks created using the tape on background, easier to use stippling method for this stencil rather than swirling as you can see the brush marks. Use the lighter tone for this part. 5. In order to create a line of diamonds use stencils 1 and 2 alternately, this is what confused me about having 2 of the same (I am also blonde). 6. DON’T GIVE UP – once you’ve covered your surface using stencils 1 and 2 it may just look like a bunch of diamonds, but wait to add stencils 3 and 4 to really see it coming together (this is the really really exciting bit I mentioned earlier), it's so exciting both helen and myself may have squeaked a little bit. 7. Like stencils 1 and 2, use 3 and 4 alternatively, although instead of side by side use one above and one below and its fab because it doesn’t matter which way you decide to go, it’ll work either way. Use the darkest tone for this part. 8. Keep on lining the stencils with the dots, don’t make the mistake of removing any, don’t do that til the very end, and it’s so satisfying to see it coming together after a few rows of the darker paint filling in the shadowing. I really hope that it made sense and that you guys enjoyed my first blog! Please ask if I didn’t make sense at any point and I will be back on again at some point when Helen’s not looking to blog about other projects and experiments I've been getting up too! How to make a stencilled door curtain. Curtains aren’t just for windows. Beat the chills with this creative and practical door curtain project. Start by measuring the size of your door to work out the size of the fabric you will need. Remember your curtain will need to have extra length or header tape and a deep hem. The total width for your curtain including the side panels should be the width of your doorway plus a half, for extra weight use twice the width. Now to stencil the fabric. Firstly launder and iron your fabric, then apply a light coat of SprayMount or similar repositioning adhesive onto a flat surface to hold fabric in place while you’re stenciling. Choose your desired colours and stencils. We used ‘blossom’ one of 15 card stencils in the ‘Stencil it’ book. Alternatively this stencil is for sale in various sizes from The Stencil Library. Apply a light mist of SprayMount to the back of the stencil and press into position. Use good quality stencil brushes and paint suitable for fabric. Work any excess paint from the brush onto paper towel, you only need a little amount of paint to stencil with. We chose to stencil our design to look like the blossoms were falling in a descending pattern towards the floor. Take your now stenciled fabric together with your lining fabric, remember taking into account the seam allowance. Lay the lining fabric on top of the curtain: right side’s together. Pin the two pieces in place. Sew Along each side with the seam allowance. Hem the bottom of your curtain. Now you want to turn your curtain right side up. We sewed header tape to our door curtain which allowed us to gather the fabric then we attached metal hanging rings to it. and hung it from a portiere rod. If you’re working with a curtain pole you can attach rings or just fold over the top edge and make pocket for the pole to go through. Pin in place and sew. This is what a portiere rod looks like. A portiere rod raises the curtain as the door opens so that the movement is not impeded by fabric dragging on the floor. and allows it to drop when the door is closed ensuring a snug fit to keep out draughts. A deep hem helps to further reduce draughts. The heavy, cotton velvet came from Factory Fabrics in Prudhoe. The curtain was sown and stencilled by students Melanie, Laura and Ashley. The project was written by Ashley and I and photographed by me. My name is Dyane Brown, a second year student from Newcastle College. I am currently on a work placement at The Stencil Library. I attempted stencilling back in the 80's when it was the latest fad. I quickly went off it due to the rubbish stencils that were available at the time and not really knowing what I was doing. I now have a new found love for stenciling having being taught the correct way to do it by the Lovely Helen Morris. The vast range of very clever intricate stencils produced by her husband the genius Mr Chips has given me a whole new way at looking at stencilling and the creative ways you can use them. We have recently been making samples of the new cross stitch rose stencil. A good tip that Helen shared is to paint a piece of lining paper with your chosen background colour and test your stencil onto it before you do it onto the wall. This way it gives you a better idea of how it will look when finished and you can change any colours that you're not sure about. This saves you from repainting your wall and having to start again if the colours are all wrong! So if like me you have been put off stencilling in the past, give it another go, you might end up loving it and become a stencil convert like me! My name is Laura; I am one of the design students currently working with Helen Morris here at The Stencil Library. Following the preparation and decoration of the Christmas house tour, we have been working on creating room sets. I thought I would share our progress with you. A room set shows the stencil in context. Here I have tried to combine contemporary and vintage with the modern vase and the vintage side table. The flash of orange in the flower offers a great contrast to the sullen grays of the Elizabethan stencil on the wall. Here I have created a retro kitchen set. The lily of the valley stencil is VN156. I love the contrast between the blue tea pot and the yellow wall. I went with the white table to draw the eye to the stenciled wall and the tea pot. There you have it, 2 simple room sets fit for a page in a glossy magazine, I hope you will agree. Hi, my name is Louise I recently started my work placement with Helen Morris at The Stencil Library. On the second day of my placement Helen took us on a little field trip to visit an amazing home accessories store called RE in Corbridge, near Stocksfield. This store is tucked away down one of the side streets, and what a find it is. When entering the store you are met with an array of fantastically put together displays, each depicting a different style in its own way. What really caught my attention were the vintage blue and white plates re-fired with bold, coloured butterflies on them. I think this is a great way to modernise more traditional patterns and make them unique. I felt inspired by these plates and would like to try making something similar myself. To do this I would choose a beautiful stencil and apply it onto a Willow Pattern plate. These blue and white patterned plates can often be found at car boot sales, antiques stores or even charity stores. Helen has lots of butterfly stencils. The vintage butterfly plates from RE can be bought mail order too, each one is different. How to make a stencilled draught excluder. A creative way to keep chills at bay this winter is to make a draught excluder. Start by measuring the width of your door. Your draught excluder needs to be longer then your door width. This is important as to ensure the draught excluder is a snug fit and keeps the draught out. We chose a sausage style shape with drawstrings either side for a decorative style. We also made a removable cover, but that's just because we're posh. We used wadding as a filler, but you can just stuff it with old rags pushed into stockings or tights. For our outer cover we used a black velvet to create a luxurious look. Factory Fabrics of Prudhoe is an excellent source for lengths of velvet. Launder and iron your fabric. After ensuring the material is crease free apply a light coat of Spraymount onto a smooth work surface and smooth the fabric onto it. The slight tack on the surface ensures that the material stays in place while stenciling. Apply another light mist of Spraymount to the back of the stencil and position it onto the fabric. Lining the stencil against the selvedge is handy if a straight line is needed. Work off any access paint onto paper towel, then stencil in light circular motions, building up the colour as you go. Repeat the stencil by using the registration marks. We used SIB19-S Elizabethan stencil. 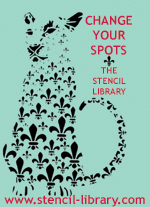 A slightly smaller version of the same stencil is included in 'Stencil It' by Helen Morris. A matt off-white acrylic paint was chosen to contrast against the black velvet. We started by making our inner 'sausage' for the excluder. Take a material such as cotton (an old pillow case or sheet could be ideal) cut out a rectangular shape, depending on how fat you want the draught excluder to be. Mark 1.5cm inwards from both sides of the rectangle. This is the seam allowance. With right sides together pin and stitch the seams to make one long strip. Leave a gap for turning through. Cut out two circles, these will be the ends of the draught excluder. pin and stitch the circles to both ends. Turn though. Stuff it and stitch up the gap. You now have a smart, lump free, sausage shape. Make the cover: Take your stenciled material and wrap around the sausage shape. Not too tight, leave a lose fit. Mark where the ends meet, draw a line. Now fold over the top and bottom of the material. Pin and sew. This is where the drawstrings will thread through. Fold the fabric so stencilled sides are together. Pin and sew along the marked line leaving a 7cm gap half way. Iron seams and turn through. Stuff the basic sausage shape into the stenciled cover. Sew the gap using a blind stitch and matching thread. Cut out two neat circles from velvet, slightly bigger than the ends of the sausage shape﻿﻿. Choose a cord or a strong ribbon for your drawstrings. Turn through so the stencilled side is now showing. Thread drawstrings and tuck the circles into place over both ends. Pull tightly and finish with a decorative bow. You can even get fancy and add a loop or a hanging tab for storage purposes. The ends are ruched together to give a decorative effect. 1. When ironing velvet, place fuzzy sides together so as not to crush the pile of the velvet. Alternatively press the fabric with the fuzzy side onto a soft towel. 2. If spraying the work surface with the repostioning adhesive ( Spraymount) to stop your fabric moving whilst stencilling is not practical try this.. cover the work surface completely with lining paper. Spray the paper with a light misting of adhesive and smooth the fabric onto that. 'During a weeks work experience at The Stencil Library I got the opportunity to do a photo shoot using the Gakubuchi stencil ‘Gakubuchi’ is Japanese for Frame or Picture Frame. Work experience is compulsory for all 14-15 students in English schools; it’s where students get an unpaid placement at schools or businesses for a week experiencing a working life. I chose to do work experience at The Stencil Library as I am passionate about art and love the art lessons I’ve had at school. Since I was little my mum has bought stencils from the shop and stencilled many rooms in our house including every bedroom I’ve ever had from yellow and blue circus themed, to pink fairies right up to my current room which was the first thing I stencilled myself, in pink and black Japanese Cherry Blossoms. I hope to when I’m older go to University and study Architecture, Interior Design or both and I thought The Stencil Library would help me experience new perspectives of design which I could apply in my later life. At The Stencil Library I experienced all aspects of the business; I used Photoshop, Freehand, helped with databases and with packaging the stencils which is harder than its sounds and I found most difficult, tearing lots of brown paper in an attempt to at least pack one stencil successfully! I was also kindly given the opportunity to paint and do my own photo shoot using the Gakubuchi stencil. I liked the Gakubuchi for its intricate ornate pattern that formed the large frame. I chose to do the stencil in cream as I felt that it not only complimented the blue background wall but also matched the delicate design of the stencil. then wanted something slightly more unusual and contemporary in the shoot so I hung objects in the stencilled frames. My choices of ballet shoes was because as well as their colour being suited to the background and frame the elegance and regalness associated with ballet also applied to the frame. I then chose to carry on with the dance theme and prop tutus and character skirts and all sort of dance things in the shoot making the room resemble a young dancer’s boudoir.